This collection is the work of famous Filipino artists, Fernando Amorsolo, Pablo Amorsolo, Fabian dela Rosa, and I. L. Miranda. 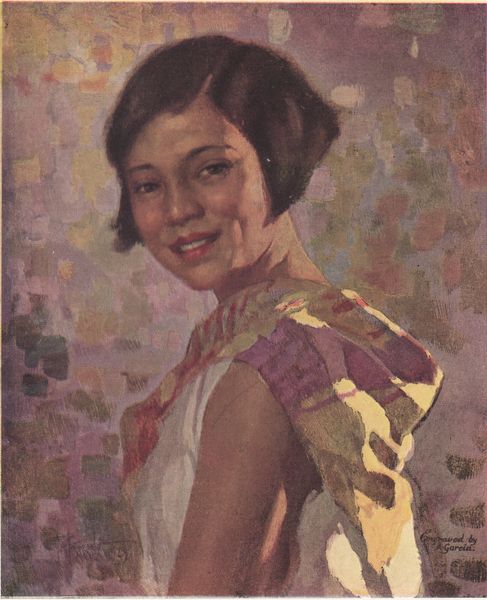 All of the 12 paintings and pastel drawings were made for the covers of Philippine Magazine from June 1928 to May 1929. Attractive as they are, they must not be taken as representing the best work of these painters. 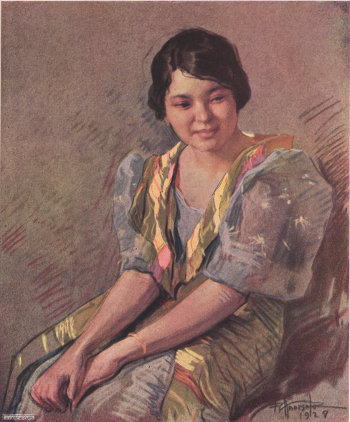 Modern Manila Girl, painted in oil by Fernando Amorsolo. Long before the arrival of the Spaniards, the Manila Bay area was occupied by the Mohammedan people of western Borneo. Mohammedan Manila was burned by Marquis de Goiti in 1570. The following year, Legazpi, the conqueror of the Philippines and the first Governor-General, occupied the site and designated the new city he built there as his capital. 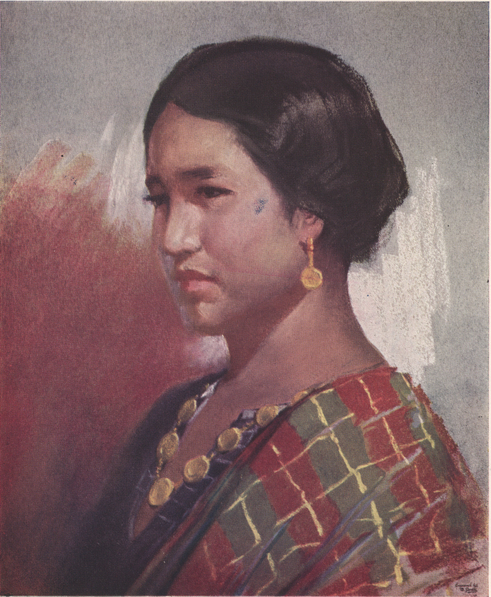 Bisaya Girl, water color, by I. L. Miranda. The Bisayans in general may be rather sharply divided into three large language groups which combined easily outnumber all others in the Philippines, the Cebuanos, the Ilonggos of Panay, and those of the Warays of Samar and Leyte. In addition, there are several minor dialect groups, among them being that of the Aklan. Historically, the name Bisayan was first applied to the people of Panay, though the Cebuanos and the Samar-Leyte groups entered the Philippines at an earlier time. 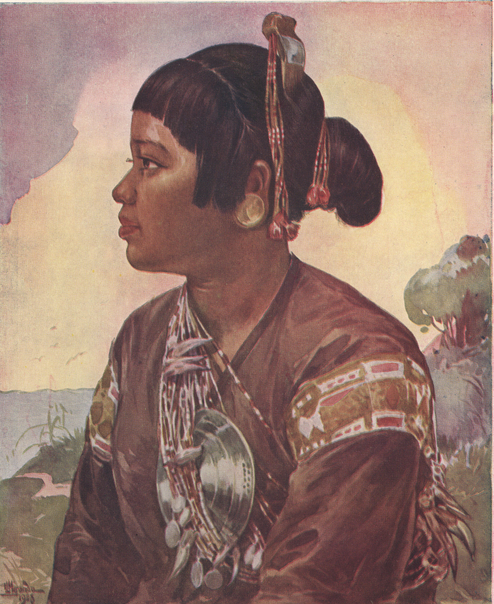 Ancient historical documents indicate that the Panayan people came to the Philippines from Borneo, though their original homeland is farther south in central and southern Sumatra. Manila Girl, pastel, by Fabian dela Rosa. Much of Manila are relatively pure Tagalogs. Some are Spanish/Chinese/Tagalog mestizos, some are pure Chinese, some are foreigners, and some are from other Philippine groups. Practically every people in the Philippines are represented in Manila to some extent. Tagalog Girl, pastel, by Pablo Amorsolo. The Tagalogs occupy the provinces of Tayabas, Batangas, Cavite, Laguna, Rizal, Bataan, Bulacan, Nueva Ecija, and Manila. Considerable numbers are also found in Camarines Norte, Tarlac, and southern Zambales. Outside Luzon, the island of Marinduque is wholly Tagalog, and Masbate partly so, as is the northern two-thirds of Mindoro. 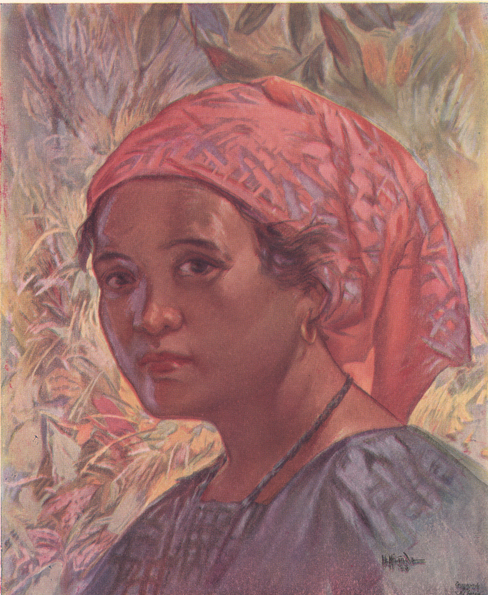 Bicol Girl, pastel, by Fernando Amorsolo. The Bicols occupy a relatively continuous, area covering Camarines Sur, Albay, and Sorsogon in southern Luzon, a part of Masbate, and the smaller islands of Catanduanes, Burias, and Tikao. 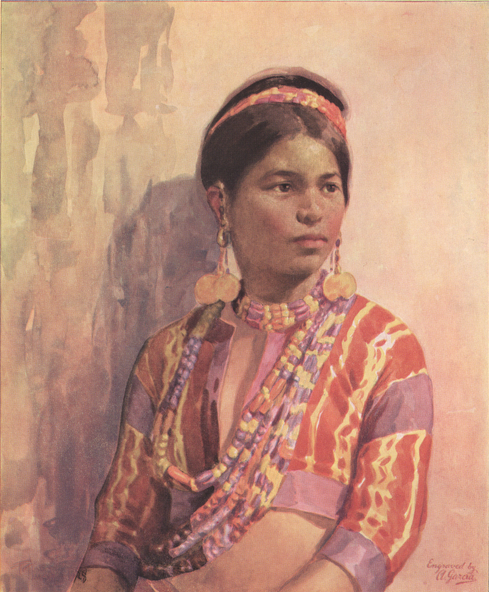 Igorot Girl, oil, by Pablo Amorsolo. The people known as the "Igorots" consist of several rather distinct peoples who occupy Benguet, Amburayan, Lepanto, and parts of Bontok, with a few also in the provinces of Nueva Vizcaya, Nueva Ecija, Pangasinan, La Union, Ilocos Sur, and Abra. The girl shown here represents a type resident in the northern part of the province of Bontok, where a mixed Igorot-Kalinga group lives. 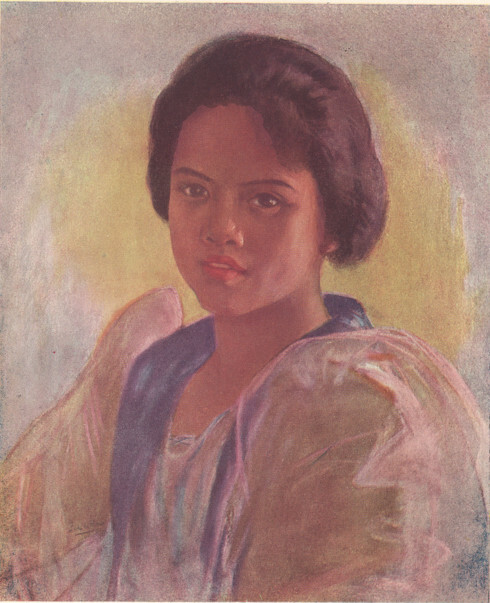 Ilocano Girl, pastel, by I. L. Miranda. The Ilocanos occupy a large part of the Cagayan and Magat river valleys, many parts of Abra and the Mountain Province, Pangasinan, Zambales, Tarlac, and Nueva Ecija. In addition, large numbers have settled in Mindanao, Palawan, British North Borneo, and Hawaii. This group, therefore, is the chief pioneering people of the Philippines. The Ilocanos are noted for their industry and their habits of economy. 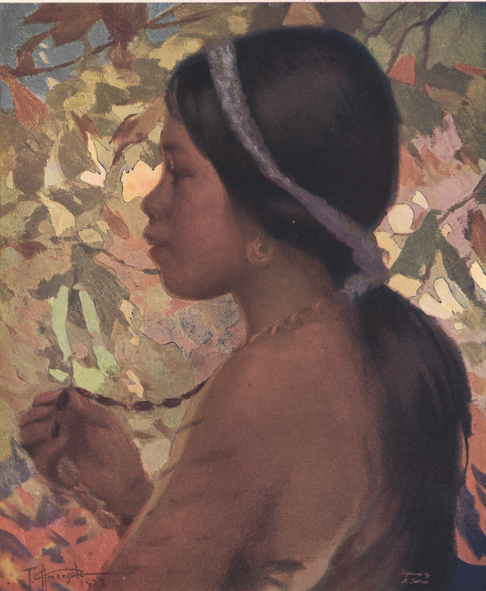 Ifugao Girl, oil, by Fernando Amorsolo. The Ifugaos live chiefly in the province of Ifugao and some live in Nueva Vizcaya, Bontok and Benguet. 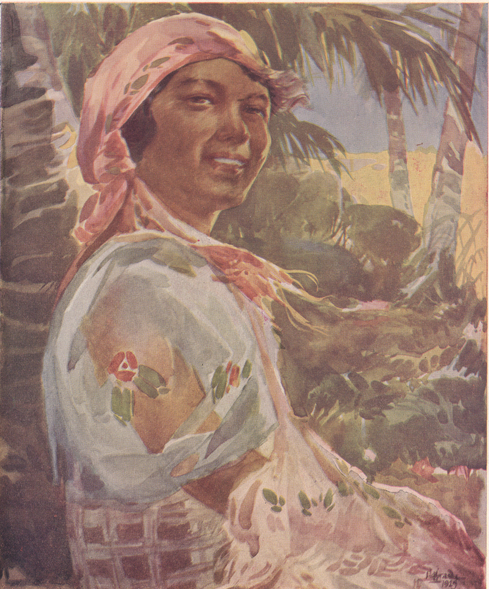 Kalinga Girl, water color, by Fernando Amorsolo. The name "Kalinga" has been applied to all the inhabitants of the province of Kalinga in northern Luzon. In general, most of them are rather tall and finely built, and form a decided contrast with the shorter groups around them. 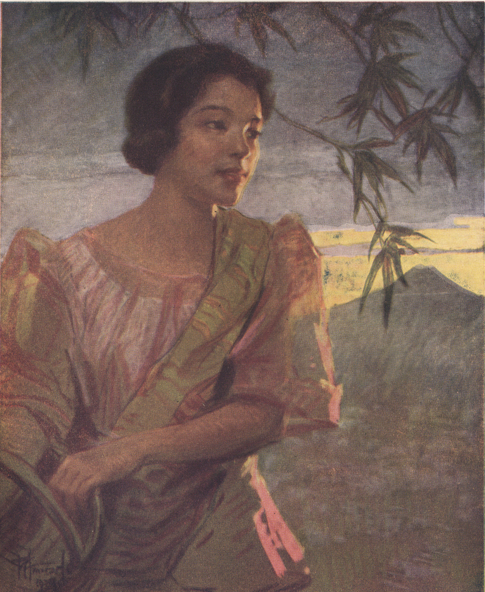 Pampanga Girl, pastel, by Fernando Amorsolo. They inhabit the province of Pampanga and about a third of the province of Tarlac. 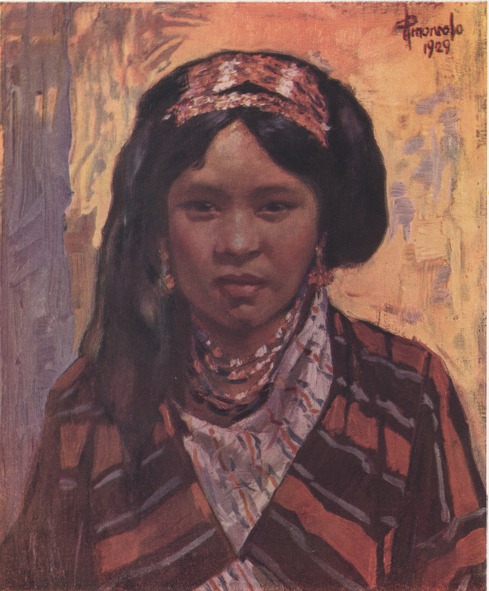 Mandaya Girl, water color, by I. L. Miranda. The Mandayas live in Davao, Mindanao. 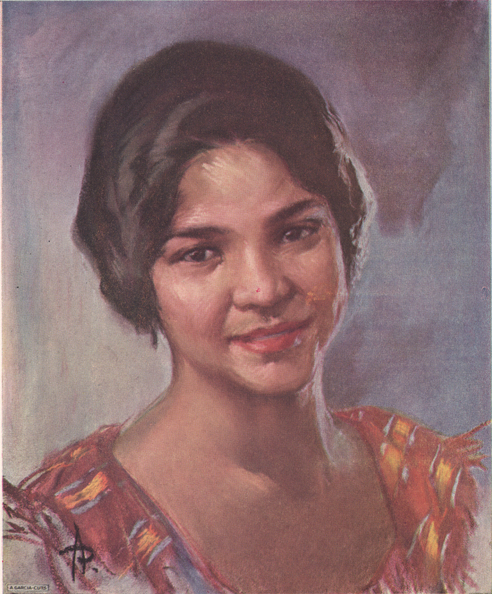 Sulu Girl, pastel, by Pablo Amorsolo. The Sulus occupy the island of Jolo and other of the larger islands of the Sulu Archipelago, Cagayan de Sulu, and parts of southern Palawan. Outside the Philippines, the Sulus are found chiefly in northern Borneo.